This article is about the landmark theater. For the theater movement, see Theater in Chicago. Chicago Theatre's Facade in April 2009, as viewed from State Street. The Chicago Theatre, originally known as the Balaban and Katz Chicago Theatre, is a landmark theater located on North State Street in the Loop area of Chicago, Illinois, in the United States. Built in 1921, the Chicago Theatre was the flagship for the Balaban and Katz (B&K) group of theaters run by A. J. Balaban, his brother Barney Balaban and partner Sam Katz. Along with the other B&K theaters, from 1925 to 1945 the Chicago Theatre was a dominant movie theater enterprise. Currently, Madison Square Garden, Inc. owns and operates the Chicago Theatre as a performing arts venue for stage plays, magic shows, comedy, speeches, and popular music concerts. The building was added to the National Register of Historic Places June 6, 1979, and was listed as a Chicago Landmark January 28, 1983. The distinctive Chicago Theatre marquee, "an unofficial emblem of the city", appears frequently in film, television, artwork, and photography. The Y-shaped figure behind the horizontal word Chicago on the State Street marquee is the city's "municipal device", a badge which symbolizes the forked Chicago River at Wolf Point. Abe and Barney Balaban, together with Sam and Morris Katz—founders of the Balaban and Katz theater chain, built the Chicago Theatre in 1921 as one of a large chain of opulent motion picture houses. The theater would become the flagship for 28 theaters in the city and over 100 others in the Midwestern United States that B&K operated in conjunction with the Paramount Publix chain. Cornelius W. Rapp and George L. Rapp were primary architects and the final construction cost was $4 million ($53.2 million in 2016 dollars). The Rapp brothers also designed many other B&K properties in Chicago, including the Oriental and Uptown Theatres. Preceded by the now-demolished Tivoli Theatre of Chicago and Capitol Theatre of New York City, the Chicago Theatre was the "...largest, most costly and grandest of the super deluxe movie palaces" built up to that date and thus now the oldest surviving grand movie palace. The Chicago Theatre was among the earliest theaters in the nation to be built in Rapp and Rapp's signature Neo-Baroque French-revival style. It is the oldest surviving example of this style in Chicago. The original 1921 interior decoration of the auditorium included fourteen large romantic French-themed murals surrounding the proscenium by Chicago artist Louis Grell (1887-1960), a common feature that Rapp and Rapp architects included in their movie palace designs. When it opened October 26, 1921, the 3,880 seat theater was promoted as the "Wonder Theatre of the World". Capacity crowds packed the theater during its opening week for the First National Pictures feature The Sign on the Door starring Norma Talmadge. Other attractions included a 50-piece orchestra, famed organist Jesse Crawford at the 26-rank Wurlitzer theatre organ—"Oh, yes, it was mighty," recalled Orson Welles:151— and a live stage show. Poet Carl Sandburg, reporting for the Chicago Tribune, wrote that mounted police were required for crowd control. The theater's strategy of enticing movie patrons with a plush environment and top notch service (including the pioneering use of air conditioning) was emulated nationwide. 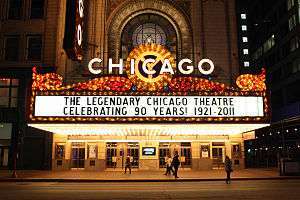 During its first 40 years of operation, the Chicago Theatre presented premiere films and live entertainment. Throughout its existence, many of the top performers and stars of their day made live appearances at the theater. One of its biggest draws was live jazz, which Balaban and Katz promoted as early as September 1922 in a special event they called "Syncopation Week". This proved so successful that jazz bands became a mainstay of the Chicago Theatre's programming through the 1920s and into the 1930s. In preparation for the 1933 World's Fair in Chicago, the Chicago Theatre was redecorated. Part of the World's Fair renovation included another commission by Balaban & Katz for Grell to repaint the architecturally enclosed fourteen murals. This time Grell chose Greek/Roman deities as the theme for the large oil on canvas murals which are on public exhibit today in the theatre auditorium. The building has been associated with popular culture occasions. For example, Ronald Reagan announced his engagement to Jane Wyman at the theater. Another modernization occurred in the 1950s when management discontinued stage shows. The theater in October 1944 with blue-gray paint. During the economic and social changes of the 1970s, business at the theatre slowed for owner Plitt Theatres, affecting ongoing viability. In 1984, the Chicago Theatre Preservation Group purchased the theater and adjoining Page Brothers Building for $11.5 million ($26.2 million today). The group attempted to maintain the venue as a picture theater but was unable to remain viabile and the facility closed September 19, 1985. 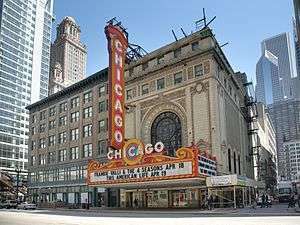 The Chicago Theatre Preservation Group commenced renovation of the buildings which were completed in 1986 at a cost of $9 million ($19.5 million), with $4.3 million ($9.3 million) spent on the Theatre. The renovation by architects Daniel P. Coffey & Associates, Ltd. and interior design consultants A.T. Heinsbergen & Co. restored the Chicago Theatre to a 1930s appearance and a seating capacity of 3,600. The theatre reopened September 10, 1986, with a performance by Frank Sinatra marking the culmination of a four-year historic preservation effort championed by the Landmarks Preservation Council of Illinois, The gala reopening was also symbolic because Sinatra had performed at the theater in the 1950s. The restoration of the adjoining Page Building, itself a Chicago and National Register landmark, provided office space to support the theatre. The theater, like its neighbor the Joffrey Tower, is an important component of the North Loop/Theatre District revitalization plan. Theatre district revitalization plans go back as far as Mayor Jane Byrne's 1981 plan. On April 1, 2004, TheatreDreams Chicago, LLC purchased the building for $3 million. The Balaban and Katz trademark is now the property of the Balaban and Katz Historical Foundation. New York's Madison Square Garden Entertainment announced October 11, 2007, that it would buy the theater. 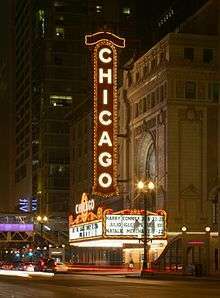 Prior to 2008, the theater hosted the annual opening film of the Chicago International Film Festival until the festivities moved to the nearby Harris Theater. Mayor Richard M. Daley declared July 12, 2005 "Roger Ebert Day in Chicago" and dedicated a plaque under the marquee in his honor. The theater is featured in the book, The Chicago Movie Palaces of Balaban and Katz, by David Balaban, grandson of the original owner. As of 2011, as permitted under the terms of sale dictated by the city, the vertical CHICAGO sign had a logotype for Chase Bank added to indicate sponsorship. Auditorium detail showing murals, chandeliers, and gilded decorations. The structure is seven stories tall and fills nearly one half of a city block. The 60-foot (18 m) wide by six-story tall triumphal arch motif of the State Street façade has been journalistically compared to the l'Arc de Triomphe in Paris. The central arch-headed window adapts the familiar motif of Borromini's false-perspective window reveals of the top floor of Palazzo Barberini, Rome. The coat of arms of the Balaban and Katz chain—two horses holding ribbons of 35 mm film in their mouths outlined by a border of film reels—is set inside a circular Tiffany stained glass window inside the arch. The exterior of the building is covered in off-white architectural terracotta supplied by the Northwestern Terra Cotta Company with Neo-Baroque stucco designs by the McNulty Brothers. The interior shows French Baroque influence from the Second French Empire. The grand lobby, five stories high and surrounded by gallery promenades at the mezzanine and balcony levels, is influence by the Royal Chapel at Versailles. The grand staircase is patterned from the grand stair of the Paris Opera House and ascends to the various balcony levels. Marshall Field and Company supplied interior decorations including drapes and furniture. The crystal chandeliers and bronze light fixtures fitted with Steuben glass shades were designed and built by Victor Pearlman and Co. The stage dimensions exceed 60 feet (18 m) in width and 30 feet (9.1 m) in depth. The orchestra pit is approximately 6 feet (1.8 m) below stage level, 54 feet (16 m) wide at the stage lip, with a depth of 15 feet (4.6 m) at center. An adjustable pit filler can be used for performances requiring other levels. At the time of the building's 1978 application for the National Register of Historic Places designation, the venue's marquee had been replaced twice. The original marquee was basic and facilitated two lines of text for announcements. The 1922–23 marquee had ornate "flashing pinwheels, swirls and garlands of colored lights". It also included "milk glass letter attraction boards, and CHICAGO in large letters on three sides". The 1949 replacement was similar to the second marquee, but its attraction boards were larger and the oversized CHICAGO lettering only appeared on the front. Until Balaban and Katz' 1969 sale to the American Broadcasting Company, their name was on the marqee. The entire marquee was replaced in 1994, but retains the look of its predecessor. In 2004, the original marquee was donated to the Smithsonian Institution. The marquee is featured in numerous movies and TV shows set in Chicago, and its neon font was used in the title of the 2002 film Chicago. The theatre is also known for its grand Wurlitzer pipe organ. At the time it was installed it was known as “The Mighty Wurlitzer” and could imitate the instruments of an orchestra. Jesse Crawford, a noted Theatre Organ performer, is attributed as the person who "was responsible for the design and choice of sounds". The organ came from Wurlitzer's North Tonawanda Barrel Organ Factory in July 1921 with "four manuals and 26 ranks of pipes-Opus 434". The American Theatre Organ Society restored the organ in 1970, which had expanded the organ from 26 to 29 ranks by that time. It is one of the oldest Mighty Wurlitzers still in existence. 1 2 3 4 5 6 Schulze, Franz; Harrington, Kevin (November 15, 2003). Chicago's Famous Buildings. University of Chicago Press. pp. 58–9. ISBN 0-226-74066-8. 1 2 Steiner, Frances (March 1999). The Architecture of Chicago's Loop. Sigma Press. p. 27. ISBN 0-9667259-0-5. 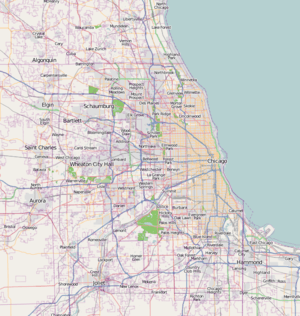 ↑ "National Register of Historical Places: Illinois (IL), Cook County". National Register of Historic Places. nationalregisterofhistoricplaces.com. May 1, 2007. Retrieved August 10, 2009. ↑ "Chicago Theatre: home of WurliTzer (opus 434)". Chicago Area Theatre Organ Enthusiasts. April 19, 2012. Retrieved June 13, 2014. 1 2 3 Klingsporn, Geoffrey (May 15, 2004). "Balabian & Katz". Encyclopedia of Chicago. University of Chicago Press. Retrieved June 13, 2014. 1 2 3 "Chicago Theatre". Commission on Chicago Landmarks. Retrieved June 13, 2014. ↑ Kaplan, Jacob (December 10, 2008). "The Municipal Device". Forgotten Chicago. Retrieved June 13, 2014. ↑ "The Chicago Municipal Device (Y-Shaped Figure)". Chicago Public Library. Retrieved June 13, 2014. ↑ Gomery, Douglas (May 1992). Shared pleasures: a history of movie presentation in the United States. University of Wisconsin Press. p. 57. ISBN 978-0-299-13214-9. Retrieved June 13, 2014. 1 2 3 4 5 6 7 Lampert, Donald K.; Corliss, John L. (July 1978). "National Register of Historic Places Inventory: Nomination Form" (PDF). Illinois Historic Preservation Agency. Retrieved September 6, 2013. 1 2 3 "Historic Theatres & Movie Palaces of Balaban and Katz: The Chicago Theatre, A Brief History". Uptown Chicago Resources (online). Compass Rose Cultural Crossroads, Inc. 2007. Retrieved June 13, 2014. ↑ Jewett, Eleanor (November 24, 1929). "American show limited in scope". Chicago Daily Tribune. p. H5. 1 2 3 4 5 6 7 "History of the Chicago Theatre". MSG Holdings. Retrieved June 13, 2014. ↑ Tarbox, Todd, Orson Welles and Roger Hill: A Friendship in Three Acts. Albany, Georgia: BearManor Media, 2013, ISBN 1-59393-260-X. ↑ "Exhibitions and Commissions: Chicago Theatre". Louis Grell Foundation. Retrieved June 13, 2014. ↑ Osgoode, Charles (June 24, 2001). "It's a change of seasons for Tree Studios". Chicago Tribune. p. 5, Arts & Entertainment. Retrieved June 13, 2014. 1 2 3 4 "Dispute Over Theater Splits Chicago City Council". The New York Times. May 8, 1984. Retrieved June 13, 2014. 1 2 3 4 5 "1986: The Chicago Theater Reopens". Chicago Public Library. February 2006. Archived from the original on February 12, 2008. Retrieved May 7, 2007. ↑ Granacki, Victoria. "About Us: Landmarks Illinois" (PDF). Landmarks Illinois. Retrieved June 13, 2014. ↑ "Page Brothers Building". Chicago Commission on Landmarks. Retrieved June 13, 2014. ↑ Sinkevitch, Alice, ed. (April 12, 2004). AIA Guide to Chicago. Harvest Books. p. 53. ISBN 0-15-602908-1. ↑ "Theatre Dreams". Archived from the original on December 30, 2007. Retrieved March 2, 2007. ↑ Patner, Andrew (March 28, 2004). "Restoration drama: TheatreDreams determined to revive Chicago stage". Chicago Sun-Times. Retrieved June 13, 2014. ↑ Jones, Chris (October 10, 2007). "Chicago Theatre draws buyer". Chicago Tribune. Retrieved June 13, 2014. ↑ Caro, Mark (October 17, 2008). "Fest 'Blooms' with Chicago connections". Chicago Tribune. Retrieved June 13, 2014. ↑ "Balaban and Katz Historical Foundation". Balaban and Katz Historical Foundation. Retrieved June 13, 2014. ↑ John Greenfield (November 16, 2011). "Chase logo on Chicago Theatre: What's up with that?". Time Out. Retrieved July 9, 2014. ↑ "The Chicago Theatre: Venue Technical Packet 2006" (PDF). Archived from the original (PDF) on December 2, 2007. Retrieved May 1, 2007. Wikimedia Commons has media related to Chicago Theatre.